Some things we eat regularly are so simple I don’t think to post them as recipes to Cooking Chat. Refried bean tacos would fall into this category. We eat them as a quick, meatless weekday meal a couple times per month. I’ll add some variety to the basic beans, cheese and lettuce fillings based on what we have on hand. Sometimes we might add some leftover chicken or pork (foregoing the meatless concept in this case) or maybe some avocado. 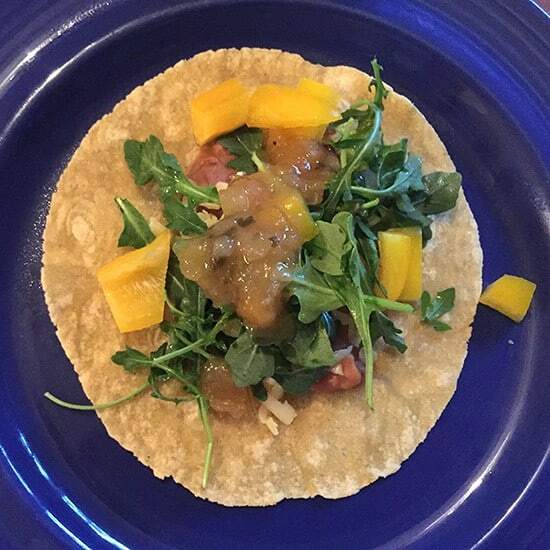 This time, it was a very tasty salsa that really added a nice twist to the tacos that has me bringing you a Bean Tacos with Mango Salsa recipe today. The lively tropical kick of the mango salsa provided a great finish to the tacos dish. If you want to make your own, I’ve got a mango salsa recipe here, where I used it to top some grilled halibut. But for me a bean taco night is all easy, and I simply used a prepared salsa for this recipe. We went with the Bahama Mama Mango Salsa from the Boston Burger Company. We got it at our local Whole Foods; it also seems to be distributed at specialty shops in New England. It’s a very good mango salsa, but I’m sure you could do well using your favorite brand of mango salsa or by making your own. Tacos are a great DIY meal. Heat up the beans, and spread the fixings out for a make your own taco bar. We like to have a combination of hard and soft tacos, so that’s the way we wrote up this recipe. We find one soft plus two hard tacos is pretty satisfying. Of course, you could switch this up and to all one or the other. A nice thing about the hard tacos is they keep for awhile in the cabinet, making this a great meal to have ready to go on short notice during a busy week. 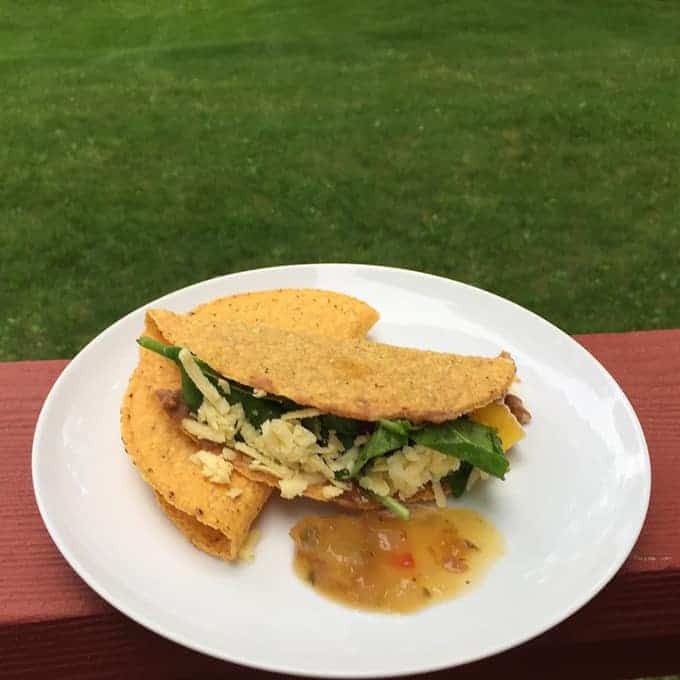 I mention these refried bean tacos as a good meatless option (make it a #MeatlessMonday, perhaps), but if you want to be sure you are doing a fully meatless meal, be sure to get refried beans without lard. I just checked the label of the Whole Foods brand we use, and they are good to go for your meatless meal. So, looking for a fast and tasty taco meal? Heat some beans and spread the fixings, and enjoy your taco night! Beer and Wine Pairings: Tacos and beer certainly are a classic pairing. I’d be inclined to serve these bean tacos with a summer ale or an IPA for a beer pairing. I tend to gravitate toward Spain when serving wine with tacos. 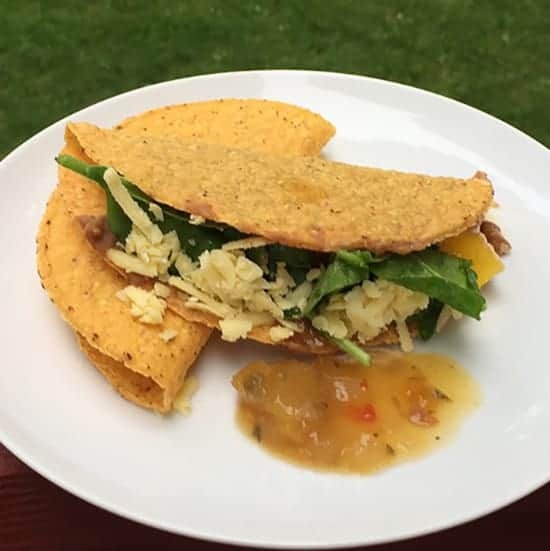 Most recently we enjoyed the Bean Tacos with Mango Salsa with 2008 Bodegas Navalon Anciano Reserva Tempranillo (13% alcohol), a great value at comfortably under $15/bottle. A rosé could also be a good choice to pick up the flavors of the mango salsa. Whatever your beverage of choice for the tacos, enjoy! Open the can of beans and scoop into a pan. Add the water, and heat on medium low, stirring occasionally. Keep warm on stovetop as you prep the fixings. 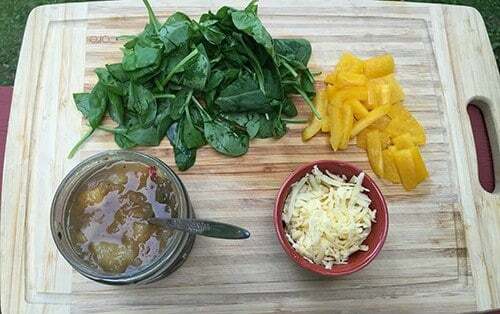 Spread out the tacos toppings for serving: place the greens, cheese pepper and salsa out on counter or table. Preheat oven to 400. Spread hard tacos on a baking sheet and cook for 2 to 3 minutes until just browned and crispy. Heat the soft tacos for 10 seconds each in microwave. 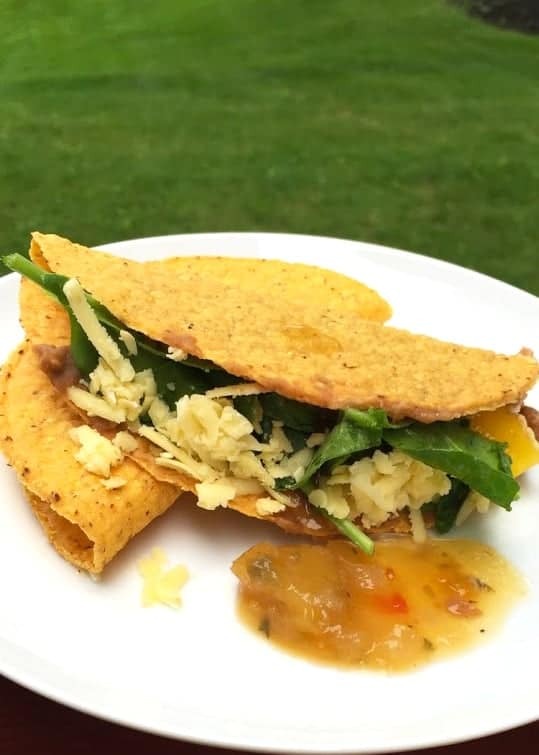 Each person make their own taco by taking a taco shell, adding a scoop of beans followed the toppings they want–cheese, greens, peppers and salsa. Love the idea of these meatless monday tacos! Seems like a simple, hearty meal! great post! thank you for sharing and i look forward to sharing it on bbc’s facebook page! Sounds good! I enjoy the BBC salsas, need to get to the restaurant one of these days!